The Wood River Veterans War Memorial honors those local Service Members who gave their lives defending the freedoms we so cherish as citizens of this great Nation. Listed on the memorial are 42 Veterans who were Wood River residents at the time of their enlistment into military service. This memorial is a testament to their sacrifice and it is hoped that through this memorial the lives and stories of these Veterans can be rightfully honored and remembered. Each Veteran listed on the memorial is categorized by Period of Service, Name, Rank and Branch of Service. 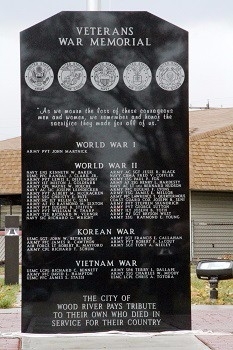 The memorial is located in Central Park at the southwest corner of Wood River and Eaton Avenues and consists of one black granite pillar with the five branches of service emblems etched into the granite along with the names of those lost. The pillar is set at the end of a lighted walkway and open-plaza area that features flower boxes, benches and flagpoles. Work on the memorial began in October 2012 with a completion and dedication date of Veterans Day, November 11, 2012 at 2:00pm. "We don't have anything in town like this, and until a few years ago, we didn't have anything at all that paid tribute to the City of Wood River veterans," Mayor Fred Ufert.